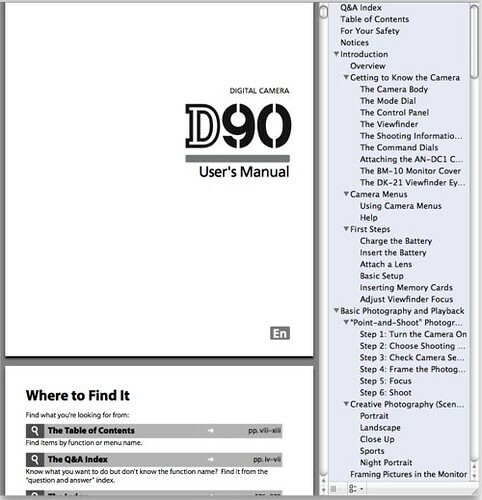 The User’s Manual — Guide to Digital Photography is now available for download at Nikon USA. Both English Language (printable and non-printable) and Spanish (non-printable) versions of the D90 owner operation guide can be downloaded. For the printable Adobe Acrobat PDF document, you’d first have to register the serial number of your Nikon D90 and then agree to a license. The printable document weighs in at 16.44 MB (megabytes) while the size of the 300-page, non-printable version is 11.5MB. The guide discusses the features of the D90 and how to use the camera.